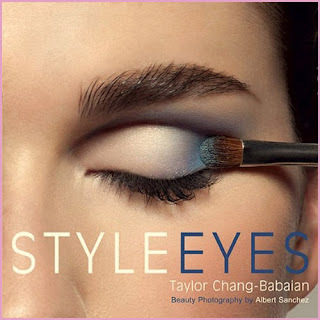 Last month on September 7th, 2010, I attended the launch for makeup artist Taylor Chang-Babaian's newest book, Style Eyes, hosted by Shiseido. Just at first glance looking through the book I can see that it is very detailed, walking you through step by step on how to create a smoky or dramatic eye. I love the photos - the closeups of the eye are intriguing because you can see the eye makeup and even showcases some interesting colors I wouldn't have considered before. I can't wait to really start delving into this book, taking in Taylor's beauty secrets and just learning tricks of the trade. I have more makeup than I know what to do with, and that's also the problem - I'm just sticking to what I know and using shades that I am used to using. It would be nice to try a new look or go with a bold color I would tend to shy away from. The book includes everything from eyeshadow layering and eyeliner techniques to steps on how to apply false lashes. Along with the book, I received Shiseido's Luminizing Satin Eye Color Trio and Accentuating Creamy Eyeliner. I haven't tried the eye color trio yet but I absolutely love the eyeliner. It goes on smoothly and stays on all day! Can't wait to see what Shiseido has in store for Spring 2011!